With help from Ann Halbower MD, of the Pulmonary Department at Children’s Hospital Colorado, Aurora, CO, the mission to serve the smallest sleep apnea patients with CPAP masks is gaining momentum. Marketing new CPAP units to a burgeoning adult patient population takes a lot of time, money, and energy. In this highly competitive environment, it’s no wonder that pediatric devices have received relatively short shrift over the last decade. Not all manufacturers, however, have ignored the “small” market. California-based ResMed got the ball rolling 7 years ago with its Mirage Kidsta mask, a unit cleared by the FDA for children 7 years of age or more than 40 pounds. Based on the Mirage platform, the Kidsta combined dual- wall cushion technology in an attempt to fashion a comfortable mask for smaller faces. In 2010, the Mirage Micro for Kids took the technology yet another step forward. From there, the evolution has continued thanks to advocates such as Ann Hal- bower, MD. Since then, the FDA has approved CPAP usage for children as young as two years. Working with many sources to help these younger kids under the FDA ruling, engineers at ResMed developed a new mask. Recently launched, the Pixi pediatric mask is designed from the ground up specifically for kids, and is not simply a “sized down” adult mask. Despite widespread perception in the industry that pediatrics is not a lucrative market, Halbower is convinced that investment in pediatrics makes good clinical and financial sense. In a wide-ranging conversation with Sleep Diagnosis & Therapy, she expressed enthusiasm for ResMed’s commitment while making an impassioned plea for more pediatric sleep apnea awareness in the medical community. Are you pleased with the FDA’s level of awareness when it comes to devices that treat pediatric sleep apnea? Ann Halbower, MD, associate professor of pediatrics, University of Colorado, and Director of Pediatric Sleep Research at the Children’s Hospital Colorado Sleep Center: We still do not have approval for kids younger than two. That is a huge problem, because that is where I see the largest unmet need. Why did you lobby for the Pediatric Medical Device Safety and Improvement Act of 2007? We found that there were too many children using devices off label, or using adult devices that were not made for, or studied with, children’s safety and efficacy in mind. I have been working since 2004 directly on trying to improve the availability of medical devices, specifically for sleep apnea in kids. I have been working with device companies, the American Academy of pediatrics, and I worked with the American Thoracic Society to develop the legislation. For me, it seems a very slow process. We know that these devices are available overseas, but they are not as available in the United States. It costs too much for premarket approval in the United States for companies to consider going through the FDA process. I am very happy that ResMed has agreed to develop some of these devices for smaller people. There is a huge market, and a huge unmet need in children who are infants to toddlers. We have zero devices available for them that are FDA approved for home use. I think that device companies would be very surprised at how often those devices would be used if they were available. Infants and toddlers often just need a device to get them by until they grow out of a problem. How would you characterize the current awareness of pediatric sleep apnea among general practitioners and the public in general? Unfortunately, pediatric obstructive sleep apnea is really a public health problem that is unrecognized. We know that 10% to 16% of children will habitually snore. Out of a population of children, at least 2% to 3% have frank apnea. What is the level of awareness among fellow pediatricians? Most pediatricians still do not screen for who is snoring and who is not. We still get many children who have had problems and symptoms for many years, but it has gone unrecognized, unchecked, and undiagnosed. It is not until new providers or teachers pick up on the fact that a child is very sleepy or is behaving abnormally. A lot of ENTs get kids with snoring or big tonsils and they operate on them, but there is another unrecognized problem. Adenotonsillectomies really only cure about 50% of all comers when it comes to childhood sleep apnea. Fifty percent not cured is a large number. How can we make sure these kids don’t fall through the cracks? We used to think that surgery would cure 90%, but so many kids have craniofacial abnormalities or concurrent asthma and allergies, obesity, and all of these things that play a role as to whether you are actually cured at the end of surgery. Almost everybody gets better, but getting all the way down to an AHI of less than one is hard to do. Are manufacturers doing enough to address the pediatric market? Device companies have not run with the ball to use that legislative act to enter into markets that still have huge, unmet needs and gaps. Sleep apnea in kids is unrecognized, not screened for, and it is a public health problem because it causes so many other secondary problems. Kids who have sleep apnea generate two and a half times more in health care costs. They tend to have cognitive issues, cardiovascular risk, and they often have superimposed obesity. This can affect their school performance, which can affect their entire economic output in life. I am putting in my two cents to say that it may look like a small market, but the market is actually pretty huge in the United States. For the new device by ResMed, we tried it on a lot of tiny heads and we found that several tweaks were necessary. I think users will find them helpful, including having the tube come off from the side so it does not obstruct vision. We have very little dead space around the nose so pressure can be delivered without CO2 retention. How early should we treat sleep apnea? We need to recognize sleep apnea and treat it early, even in infants. It is my hope that device companies will help us with that by entering into markets where we do not have devices available. Why don’t pediatricians screen more often for sleep apnea? I do not think pediatricians recognize the long-term consequences of not treating sleep apnea. We do our best to train doctors in this, but busy health care providers have 10 minutes to see somebody, and they are trying to get through immunizations, car seat safety, and other concerns. We must remember to screen for snoring, because parents do not often say to doctors, ‘My kid is snoring and I think he has a sleep disorder.’ Parents do not recognize it as a problem, especially if it has been there a long time. Unless you screen for, it is not going to be picked up. Other than snoring, what are the different signs of sleep apnea in children? Gasping, gagging, and labor are more common, but discrete signs of apnea in children are not easy to recognize,. Children can have prolonged partial obstruction. They can continue breathing without waking up, but they may be working hard to breathe, while having gas exchange abnormalities. Kids can have an adult-like phenotype, but they do not always. The younger the child, the more different are the symptoms. If infants have apnea, they may make no noise at all. For those who have a long epiglottis that is almost touching the soft palate, their apnea is silent. Or they may have stridor. Some children have very large tonsils and adenoids, but sometimes those tonsils and adenoids are so large that they prevent the vibration of snoring. What are the therapies for severe apnea in infants? In the United States, our only approved therapy for severe apnea in infants is tracheostomy, and that is a huge burden and a huge health care cost. Families do not have enough home nursing to send these kids home right away. It increases our medical costs enormously, not to mention the morbidity and mortality of kids. How difficult is it for kids to adjust to CPAP treatment? They certainly have different issues than adults. First of all, we have all learned that CPAP does not work in children unless the parents have bought into it. It is a teaching program that is required, because you must get the parents to learn why it is important and why it is important to be consistent with the child. In my sleep program alone, we have more than 520 children on noninvasive ventilation. A clinical psychologist and dedicated respiratory therapist helps to desensitize children to the masks and teach parents appropriate clinical introductory skills for the children. Once again, buy-in from both parents and a lack of fear from the children means more success. We have more success with little kids, especially special needs kids, then we do with the older teenagers who by now have decided whether they are or are not going to use it. Of course, there are fewer issues that around body image in younger children that can conflict with adherence. It is not easy to sleep with a device on the nose every night, but we find that our compliance is improved if we use a slow introductory process and we actually get the parents to help us with age-appropriate introductory skills. With newly published clinical research, Provent Therapy offers physicians and patients another choice beyond CPAP, oral appliances, and surgery. More than 2 years after bringing Provent Therapy to market, Rajiv Doshi, MD, continues his quest to educate patients and sleep doctors about the benefits of expiratory positive airway pressure (EPAP). Considering that obstructive sleep apnea is generally thought of as an inspiratory process, this has not always been an easy task. Despite the challenges, Doshi and a dedicated team at Belmont, Calif-based Ventus Medical (makers of Provent Therapy, www.proventtherapy.com) have meticulously built their case on a foundation of clinical research, patient choice, and business opportunity for sleep physicians and sleep laboratories. To date, there have been seven published studies attesting to the clinical efficacy of Provent Therapy. Doshi predicts the study will serve as the defining nasal EPAP study for years to come, with awareness only building among patients and physicians who crave choices beyond CPAP, oral appliances, and surgery. Provent’s unobtrusive two devices (that adhere to each nostril) attracted a standing-room-only audience at this year’s APSS conference, a testament to burgeoning interest that will only grow as the massive undiagnosed and CPAP non-compliant populations seek more options. For ongoing use, patients can buy packs of 30 (a 10-night trial pack is also available), using each pair for one night, and then throwing them away after use. The device uses a Micro- Valve design that attaches over the nostrils, secured in place with hypoallergenic adhesive. Doshi hopes physicians will understand that beneath the simplicity lies a validated and emerging body of clinical data that they can rely on and confidently offer to patients. How big is the acronym awareness challenge? Googling “CPAP” yields about 6.4 million hits, and virtually all selections refer to continuous positive airway pressure. Meanwhile, a search for “EPAP” garners slightly more than 400,000 links. That wouldn’t be so bad, but 99% of those refer to countless other acronyms, such as the Egyptian Pollution Abatement Project, that have nothing to do with sleep medicine. Doshi is not surprised that awareness has a ways to go. While he learned about sleep apnea during his education at Stanford Medical School, the specialized knowledge he has today has largely grown out of his own interest in the physiology of sleep. This knowledge led him to conceive of a solution to tackle sleep apnea through the expiratory process about 7 years ago. With intellectual property safeguards in place, the idea continues to gain ground in an industry largely dominated by large CPAP manufacturers with sizable marketing budgets. Industry experts agree that statistics point firmly to solid economics for the sleep industry. But despite the numbers, a rough economy can put sleep apnea on the back burner with patients viewing it as a tolerable ailment. Add on the undeniable concerns about CPAP, and Provent officials believe that viable options are needed to bring more people into the fold who may have stayed away. Rajiv Doshi, MD, invented the core technology and founded Ventus Medical. Rajiv is a Consulting Assistant Professor of Medicine and a Lecturer of Mechanical Engineering at Stanford University. He is the inventor on over 30 pending and issued patents. Rajiv earned a BS in Chemical Engineering, an MSE in Biomechanical Engineering and an MD from Stanford University. Peter Wyles, President and CEO. Peter joined Ventus Medical as President and CEO in June 2010. Peter was most recently with Bayer Healthcare for 15 years where he led consumer, pharmaceutical and medical device businesses in Germany, Japan, Canada and the U.S. He also led the global expansion and integration of Metrika, a former start-up in the diabetes space that was acquired by Bayer HealthCare in 2006. As a pioneer in dental sleep medicine, Steven R. Olmos, DDS, sees a profession beyond traditional boundaries, with oral appliance/CPAP combination therapy as an increasingly viable option. Steven R. Olmos, DDS, does not believe a weekend course is enough to prepare a dentist for a career treating sleep disorders. However, the 2008 recipient of the American Academy of Craniofacial Pain’s (AACP) Haden-Stack Award for contributions to the field of TMD and craniofacial pain does believe it can be a great way to start. Courses at Tufts and the University of Tennessee (where Olmos serves as an adjunct professor) are in this vein, but they are few and far between around the rest of the country. Why the lack of programs? Ultimately, they are difficult to organize, and cultural change within medicine can be agonizingly slow. Among health care practitioners in general, awareness of sleep disorders is relatively low, primarily because they have not been trained. Olmos estimates that most physicians are still treating comorbidities, such as hypertension and cardiovascular disease, as a separate problem. Even if these physicians got a report about apnea, they would likely refer out to a DME provider, automatically placing CPAP as the only solution, or perhaps CPAP in combination with surgery. The last thought, if ever, is an oral appliance. Literature increasingly shows that people prefer oral appliances, and Olmos sees a world in the not too distant future where it is not an either/or proposition. “Oral appliances may not be as efficacious as CPAP, but in my opinion it is never all or none,” he explains. “I have CPAP patients with horrible jaw problems who need an appliance and CPAP. It’s about finding the optimal treatment for each patient. Combining treatments can be optimal. Physicians are more open to that. In conjunction with his La Mesa, Calif-based TMJ & Sleep Therapy Research Group (www.tmjtherapycentre.com), Olmos offers courses and TMNDX software to foster a systematic data intake for all new patients. Developed from a need to educate, the software and courses are based on the premise that the role of sleep in above-the-shoulder pain must always be thoughtfully considered. 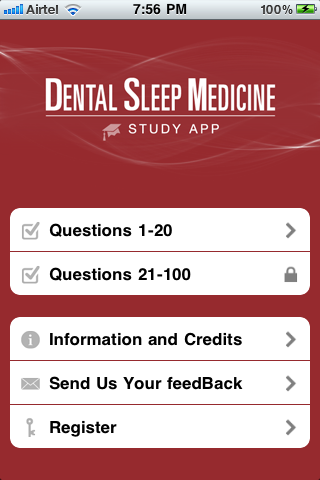 Sleep physicians who refer to dentists want to know that patients can choose based on experience of the dentist, number of appliances offered and levels of fees. When it comes to dental sleep medicine, sleep physicians tend to be concerned about the same things. Oral appliances are not covered by insurance (they believe), they are too expensive, and patients don’t come back for objective follow-up. Jamison R. Spencer, DMD, MS, often hears these complaints during his many lectures across America. He even heard it across the Pacific during a recent presentation in Australia. No matter where they happen to be, sleep docs want more treatment options for patients. Spencer, who heads the Craniofacial Pain Center of Idaho and Colorado, with locations in Boise and Denver, says referring physicians are looking to refer to dentists who not only offer the more expensive, custom appliances, but who have less expensive options available too. As a diplomate of the American Board of Dental Sleep Medicine and the American Board of Craniofacial Pain, Spencer and like- minded colleagues have spent more than a decade refining the skills and nuances of dental sleep medicine. Physicians generally appreciate the distinction of specialization in other realms, but that is not always the case when it comes to dental sleep medicine. Spencer’s low-cost Silent Sleep is one option that can serve as a temporary bridge to a more permanent solution. For those who can’t afford fully custom oral appliances, it can also be used as a long-term device under the guidance of a knowledgeable dentist. Dentists who devote the vast majority of their practice to dental sleep medicine are admittedly rare, perhaps two or three dozen in the entire country. Should the lack of specialists hinder the spread of the technology? Spencer believes that is not necessary, and many patients can still be helped. However, Spencer cautions that sometimes dentists may unintentionally do harm. After all, he says, dentists already treat sleep and breathing without really knowing it. A Canadian researcher did a small scale study that showed AHI worsened in some patients when using a night guard that dentists typically fit to protect a patient’s teeth from grinding. Dentists don’t intend to treat breathing problems with night guards, but Spencer says that in many cases they are inadvertently making some people worse. He hopes that more and more dentists will start screening their patients for sleep apnea and refer them for proper medical evaluation. Spencer uses such a screening tool in his practices, incorporating the Epworth sleepiness scale, the STOP BANG and a few questions regarding clenching and grinding. “In three cities now, we have given out that form to general dental offices,” says Spencer. We ask that they give it to everyone who walks in the door, regardless of age. We find that 20% to 30% of people who walk through the door of these offices likely have sleep apnea, or bruxism, or both. Double Standard for Oral Appliances? Oral appliances, on the other hand, seem to merit far less latitude. “Sleep physicians can have a stack of literature that says oral appliances are effective, but if they send a patient out and that patient has a bad experience, that doctor may not send people for oral appliances anymore,” explains Spencer. “If they did that with CPAP, none of them would recommend it ever again. Sometimes it seems that CPAP is allowed to fail, but oral appliance therapy is not. However, I understand that physicians may feel this way since much of the time oral appliances have been an out of pocket expense. Dentists who are experienced in dental sleep medicine now know how to help patients receive insurance benefits, and many of these dentists have become Medicare and even Medicaid providers” (Spencer is). Jamison Spencer, DMD, MS, is a dentist with practices limited to dental sleep medicine and craniofacial pain. He serves as chief technical officer for Cadwell Therapeutics, Inc., a company that manufacturers the Silent Sleep appliance and helps connect sleep physicians and sleep labs with trained dentists (www.ctisleep.com). When heated humidification alone did not do the job, survey respondents verified what Plastiflex engineers suspected: heated tubes provide added comfort. Many clinicians and sleep lab directors agree that heated tubes enhance the benefit of heated humidification. Do patients feel the same way? Rik Langerock, vice president of Sales and Marketing for Plastiflex Healthcare, sought to answer this question with detailed post-market surveillance data. He and officials at Plastiflex decided to test the Belgium-based company’s Hybernite Rainout Control (ROC) System, which includes the proprietary Heated Breathing Tube (HBT) and Power Supply Unit (PSU), on 34 CPAP users. Survey organizers drafted a questionnaire filled with responses that ranged from 1 to 4 (see graphs) to correspond with various criteria. The all-adult group had been using heated humidification, but not all had necessarily experienced rainout. “Our belief is that every patient who has a heated humidifier ought to have the benefit of a heated tube,” emphasizes Langerock. Prior to using Hybernite, 31 of 34 respondents (see Fig. 1.) reported moderate to very high condensation. After Hybernite heated tubes were installed, Langerock largely got the results he expected, with a whopping 29 reporting all condensation gone, and five ratcheting it down to moderate. No one reported high or very high amounts after Hybernite installation. Condensation in the mask is also significantly reduced by using the Hybernite Heated Hose (See Fig. 2.). Since the temperature of the air arriving at the mask is warmer, there is less chance for condensation. Condensation in the mask is also caused by the air exhaled by the patient. This air is fully saturated –100% humidified – so condensation is more likely to happen. CPAP machines blow at fairly high air speeds, and Langerock wanted to gauge the perception of cold air with a standard tube vs the Hybernite heated hose. The graph reveals a shift in the perception of cold air from very high to high with standard tubes down to none or moderate with heated (see Fig. 3.). Under the overall banner of comfort (see Fig. 4. ), Langerock went to a 5-point scale for ratings that ranged between very bad to very good. Rating “overall comfort” and “user friendliness,” Hybernite scored a vast majority of respondents rating both aspects neutral to very high. Just one person accounted for a less than user friendly rating, but far from discounting the statistical outlier, officials searched for reasons. With a background in chemical engineering, Langerock used his meticulous nature to ask and receive reasons for all answers, whether positive or negative. Hybernite largely solves the problem for those with high noise levels in the mask because moisture droplets generating condensation are reduced. Hard numbers (see Fig. 5.) show that 30 out of 32 gauged noise at zero to moderate with Hybernite in place. A handsome bathroom fixture may work perfectly, but adequate pipes and a trusty hot water heater must perform flawlessly behind the scenes. For flashy new CPAP units, proper tubing often serves the same unappreciated function. In the world of critical care ventilation, however, heated tubing is far from unappreciated. Instead, the technology is standard operating procedure because it dramatically reduces pesky condensation. Langerock, for one, believes the same standards of comfort should apply to CPAP patients. Two years ago, Plastiflex decided to expand its respected tube and hose manufacturing to other industries. After an exhaustive fact-finding period that took company officials to numerous health-related trade shows, designers narrowed their focus to CPAP tubing, a niche where complaints about condensation and comfort abounded. Plastiflex engineers ultimately came up with the Hybernite Rainout Control (ROC) System, which includes the proprietary Heated Breathing Tube (HBT) and Power Supply Unit (PSU). The Hybernite HBT connects to the PSU via a plug-and-play connector, with copper wires embedded in the tubing wall. These wires generate heat that maintains air temperature inside the tube, ultimately warding off problematic condensation. The wires are positioned for uniform heating along the tube’s entire length, a system that avoids water droplets on the wall of the tube and the resulting accumulation of moisture. Targeting America and Europe was no small endeavor, but Langerock says the relative simplicity of the message has resonated on both continents. The Hybernite ROC is essentially two main parts; one is a heated breathing tube and the other is a power supply. Once overlooked as a relatively minor part of the CPAP setup, heated tubes are joining humidifiers as viable ways to recuperate dissatisfied patients. Are there patients who don’t like the comfort benefits of Hybernite® Rainout Control (ROC) System heated tubes? Johan Verbraecken, MD, concedes that they might be out there, but he has yet to come across any. As a pulmonologist and medical coordinator at the Belgium-based Sleep Disorders Centre, Verbraecken is all too familiar with the complaints that come with CPAP therapy. Side effects such as rhinitis and a wet face in the morning can derail even the most patient of CPAP users. Meanwhile, physicians may opt to administer nasal corticosteroids to counter some side effects, and humidifiers are always on the docket. When humidifiers alone do not do the trick, Verbraecken does not hesitate to talk about Hybernite, an option that costs about 60 Euros, which most people are more than willing to pay. “Every person who has tried the Hybernite heated tubes has liked it—every single one,” he muses. Despite stellar results with heated tubes, Verbraecken believes most physicians don’t really ponder the negative aspects of CPAP. As a result, knowledge of heated tubing is relatively low. About 2 years ago, a company called Plastiflex Healthcare, a division of Plastiflex Group NV, decided to use its considerable experience manufacturing industrial flexible hoses and apply it to CPAP. Plastiflex contacted Verbraecken’s Centre in an effort to reach the European market. Plastiflex developed the Hybernite® Rainout Control (ROC) System, which includes the proprietary Hybernite® Heated Breathing Tube (HBT) and Hybernite® Power Supply Unit (PSU). The HBT connects to the PSU via a plug-and-play connector, with copper wires embedded in the tubing wall. Johan Verbraecken, MD, is a pulmonologist and medical coordinator at the Multidisciplinary Sleep Disorders Centre, Antwerp University Hospital and University of Antwerp. He serves as vice president of the Belgian Association for Sleep Research and Sleep Medicine and e-learning director of the European Respiratory Society. The National Institutes of Health 2011 NIH Sleep Disorders Research Plan identifies research opportunities to be pursued over the next three to five years in order to spur new approaches to the prevention and treatment of sleep disorders. Recommended research initiatives include looking at the connection between sleep and circadian systems (the body’s natural 24-hour cycle), studying the influence of genetic and environmental factors that could influence a person’s sleep health, and conducting more comparative effectiveness trials to improve treatments for sleep and circadian disorders. Officials at Somnetics International say the diminutive Transcend CPAP unit is not only for the travel market. In a world where tiny iPods hold thousands of memory-intensive songs, should it be any surprise that a CPAP machine finally weighs less than a pound? Clarence Johnson, president and CEO of Somnetics International, observed the trends over the last decade, and decided to start a mini revolution of his own. Somnetics received FDA market clearance for the Transcend obstructive sleep apnea therapy device in July 2010. A little more than a year later, judges at the 2011 Medtrade show in Atlanta gave Transcend the Innovation Award for the product that best exemplifies high tech and state-of-the-art design. In addition to the unit’s compact size, judges appreciated the fixed pressure CPAP’s automatic altitude adjustment, good for up to 8,000 feet, with AHI and leak detection reported to compliance software. Tight pressure control at the mask means consistent performance that Johnson maintains is more than suitable for everyday use, beyond the obvious benefits for travel. One crucial feature of the modern CPAP is humidification, and Transcend uses heat moisture exchange technology that hospital-based respiratory therapists have long relied on for critical care ventilation patients. “We are the only ones to do it in this context, and we have a great deal of intellectual property developed around the concept of applying this technology to CPAP,” says Johnson, who holds a Master of Science degree in microbiology (biochemistry) from the University of Minnesota. Somnetics sells its products through an established network of distributors and direct sales representatives serving markets across the U.S., and in key markets around the world. The unit is reimbursable under the standard CPAP HCPC code, and is accepted by most insurance companies. • Transcend’s universal AC power supply automatically converts the power current for international use. • Transcend and its accessories and parts are available at medical equipment dealers. • Transcend is competitively priced with other CPAP devices on the market. • The system comes with a 2-year manufacturer’s warranty. • The Transcend Sleep Apnea Therapy Starter System is compatible with any CPAP mask via the Universal Hose Adaptor and standard 6-foot hose. • The Transcend H6B and H9M Waterless Humidification Systems come with a proprietary interface that can be fitted with adaptors that are compatible with the most commonly used nasal seals. • Automatically compensates therapy pressure to altitudes of up to 8,000 feet. • Mobile power adaptor plugs into the DC power outlet in a car, truck, RV, boat, camper or mode of transportation with power. Mobile power adaptor can recharge the Transcend battery pack. • P4 battery system provides sufficient power to operate the device for 7 to 9 hours at a pressure setting of 14 cm H2O. The P8 battery system provides power for 14 to 16 hours of use at the same setting. Both the P4 and P8 batteries are designed to accommodate more than 250 discharge/recharge cycles with standard use. • Transcend uses patented heat moisture exchange (HME) technology to provide humidification during therapy. • The hygienic heat moisture exchanger (HME) is disposable and has no electric heating elements. HME technology works naturally with the user’s breath to provide humidification. • Can be used as a traditional CPAP using the Transcend Bedside Docking Station™ or worn on the head for maximum flexibility and mobility. • Because it features waterless humidification, Transcend can be placed securely on the bed, on a pillow, in the bed stand drawer, or on the floor – wherever it’s most convenient. • Air bearing blower technology makes Transcend quiet and vibration-free. Sleep apnea weaved its way into the national consciousness back in 2004 when legendary NFL lineman Reggie White died in his sleep at the age of 43. The NFL-apnea connection appeared yet again in a late October 2011 article in Sports Illustrated that documented the rise and dramatic fall of the Oakland Raiders’ #1 overall pick in the 2007 draft. Many NFL fans remember JaMarcus Russell, a 6-foot, 7-inch quarterback with a rocket arm who flamed out of the league, a victim of a questionable work ethic that may have been made worse by sleep apnea. At another point in the article, Russell’s former “life coach,” ex NBA player John Lucas, said: “JaMarcus is a good kid, I’m telling you, who just needs to find his motivation. But we still talk. Have him tell you about his sleep apnea. A lot [of his issues] come from that. And no one knows it.” The article does not mention CPAP, oral appliances, compliance, or whether Russell underwent any therapy for the condition. Almost 7 years after her husband’s death, Reggie White’s widow went on television this week to spread the word about sleep apnea. Last week, former San Diego Chargers’ offensive lineman Aaron Taylor, along with Rolf Benirschke, a kicker for the Chargers, attended yet another media event to talk about their own battles with sleep apnea. link to the Benirschke article. The post Sleep Switch of the Brain Discovered? At Least in Fruit Flies appeared first on Sleep Diagnosis and Therapy.